I didn’t realize it but I guess from this post, I am pretty into the whole holographic trend as now I’m really into these liners from RIMMEL. These are their Wonder Ombre Holographic Eyeliners ($5.49 @ target.com). One side is a holo and the other is a dark liner in that shade category. From L to R: Super Nova Sky (blue), Galactic Green (green), Purple Prism (purple), Golden Gaze (gold). I have not seen holographic color come in many pencil forms like this so it’s nice to be able to add a precise dash of holographic delight anywhere you want. Every woman should have at least 1 great red lipstick they turn to when they really want to turn it up. And right now is such a great time to find your perfect red as there are so many choices – tints, mattes, creams, liquids, metallics. So what’s your go-to? SEPHORA COLLECTION #Lipstories Lipstick in #26 All Washed Up, matte, $8 @ sephora.com - this is one of their mattes from the new #Lipstories collection. I thought this would be a faint red but wow, was I wrong! The intensity is about 2 steps down from a liquid lipstick. Nice job SC! MAYBELLINE Super Stay Matte Ink in #20 Pioneer - $7.99 @ target.com - one of my favorite all-time liquid lipstick products! If you're going to wear red, it's got to be precise and stay on through eating and drinking and this one does! MAKE UP FOR EVER Artist Liquid Matte Lipstick in #403 Deep Red - $20 @ sephora.com - another liquid lipstick that is bold in pigment. This one is more on the orange side of the red family. NARS Velvet Matte Lip Pencil in Mysterious Red - $27 @ narscosmetics.com, sephora.com - this is a good red if you're not up for the time commitment of a liquid lipstick and it works as a two-in-one lip liner and lip color. RIMMEL Stay Matte Liquid Lip Colour in Fire Starter - $5.49 @ walgreens.com - these liquid lipsticks from Rimmel are becoming a top pick from me. All the factors are covered - the color intensity, the way they wear, and the length of time I get out of them and of course, how comfortable they are. Big recommendation! I think I might be crowning myself (is that allowed??) the Queen of Liquid Lipsticks! I love to try them and just when I think I’ve professed my favorite, another comes along and fights for the title. The latest to enter the ring? RIMMEL Stay Matte Liquid Lip Colour ($4.99 @ target.com, ulta.com). These are super pigmented, obviously, and dry down all the way to a matte finish and feel but not desert dry on the lips (I have to think of a word to describe this!). There is zero transfer and these seem to wear-off evenly, which is such a huge plus in my book. I received 2 from PR and wanted to pick up a few other shades and had to visit 3 different stores to find them in stock! I’ll take that as a good sign that people are liking them too. Choose from 13 colors in all. Fall is here and we couldn't be more excited! And with the season come some great color trends. 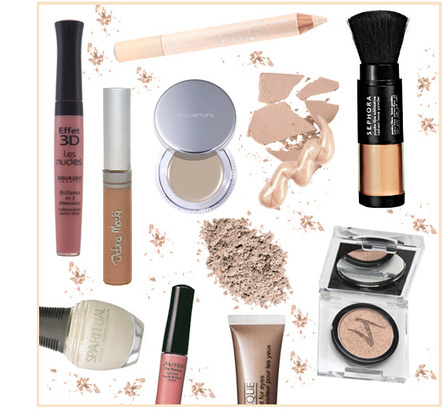 Twice a month until December, we will be featuring two colors we are loving and the makeup products that highlight them. Here's our first installment!